Empty USB Memory Stick: Style Over Substance? Fashionable, custom shape USB drives seem to be the trend among storage device manufacturers who try their skills at creating innovative designs. No matter what, there seems to be an ever present competition to come up with the smallest USB 2.0 and USB 3.0 flash drives on the market. The Empty Memory USB stick design is one great example that tests the physical bounds of what we can do with a flash drive. UK’s Logical Art is selling a line of USB flash drives that appear empty, absent of the components of a core body. Korean Yoo Kyung Shin and Taiwanese HanHsi Chen are the London-based designers of this custom USB flash drive. On her website, Yoo said the point of the device is to imply ‘invisible technology’ in the midst of USB flash drives becoming smaller and smaller these days. With its unique diamond shape, it could be mistaken for a USB jewelry stick. 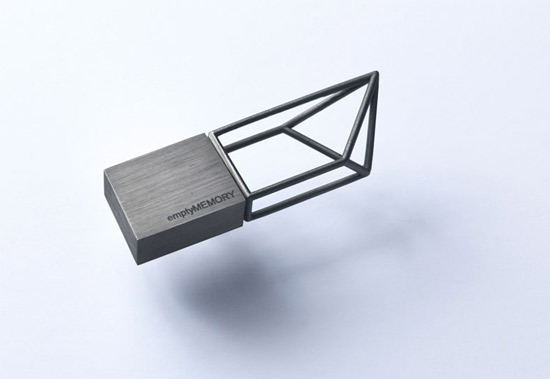 The Empty USB designers tagged the project as ‘Transparency.’ Meanwhile, the other design was made with high quality 316 stainless steel, hand-polished by craftsmen and featured in a variety of color finishes. This design was labeled as ‘Structure’ as it looks like the frame of a larger design. Aside from the form though, nothing is special with its functions. These USB devices function like any other custom flash drives with a capacity of 4 GB. As a result, the price may give you pause considering its average function capabilities. Available for pre-order at Logic Art, the stainless steel version will charge you a hefty $75 while the rhodium USB flash drive – your choice of rose gold or black – will cost you $94! Just earlier, I wrote about the Brookstone Wi-Fi Cufflinks, a set of fashionable accessories that will give you 2GB of memory plus a Wi-Fi hotspot. This little gadget will set you back for $249 but it isn’t bad considering that it’s unique and functional. But does the same goes for the Empty USB drive? Of course, you get the cool factor of having a USB that looks like it works out of thin air. The question you have to ask is whether style is more important than substance. Love it or hate it? Weigh in below! This entry was posted in Articles and tagged custom flash drives, custom shape USB drives, Empty Memory USB stick, Empty USB designer, Empty USB drive, invisible technology, Korean Yoo Kyung Shin, smallest USB 2.0 flash drives, smallest USB 3.0 flash drives, Taiwanese HanHsi Chen, Transparency, UK Logical Art, USB jewelry stick. Bookmark the permalink.